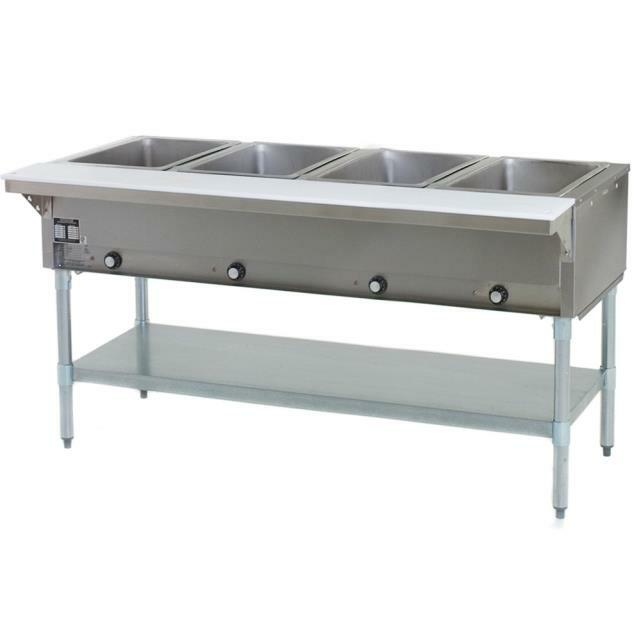 Perfect for kitchen prep areas, cafeterias, or buffets, this Eagle Group HT4 four well steam table ensures your products are hot, fresh, and ready to serve during any busy service. Each 8" deep open well has a high-output jet burner rated at 3500 BTU. Adjustable High-Medium-Low gas valves give you complete control over holding temperatures. 1" of fiberglass insulation on all sides helps maintain the four well hot food table's internal temperatures, to prevent cold spots and provide consistent, even warming. An 8" wide full length polycarbonate cutting board provides ample space for plating, preparing garnishes, or chopping vegetables. The open well Eagle Group HT4 four well hot food table features 1 5/8" diameter galvanized legs, and a galvanized undershelf for added stability. * Please call us for any questions on our steam table 4 pan propane gas openwell rentals in New Orleans, Metairie, Kenner LA and surrounding NOLA metro area.